San Diego’s exciting restaurant scene is constantly changing. Keep up with what’s new, what’s hot and what’s happening behind the scenes. Contact us at contact@sddt.com to get involved. Belmont Park recently unveiled a new restaurant, Cannonball, a 6,000-square-foot rooftop Pacific Rim-inspired restaurant serving sushi and small plates. Los Angeles-based cupcake and gourmet treats shop Yummy Cupcakes will open its first San Diego bakeshop and storefront in Encinitas on Monday, July 8. This location marks their seventh shop, adding to its three Los Angeles locations and three international stores. Jerry Warner is executive sushi chef at Cafe Japengo. Cecelia Moreno is the owner of Crest Cafe in Hillcrest. Keegan Gerhard is the chef and owner (his business card says dessert doctor) of D Bar in Hillcrest and D Bar in Denver. He has appeared on the Discovery Channel, CNN, HGTV, DIY and most notably as host and head judge of Food Network's, "Food Network Challenge" and "Last Cake Standing" series. From the family behind Bencotto Italian Kitchen in Little Italy, now comes Monello -- which translates to "naughty little boy" -- a restaurant of Milanese street food cuisine led by Executive Chef Fabrizio Cavallini. San Diego Home Cooking owner Mel Makaric originally finished school for theater makeup. Makaric opened the first San Diego Home Cooking location 15 years ago and has since opened four other locations in San Diego County. San Diego native Matt Richman wears both chef and owner hats at his restaurant, Table 926, in Pacific Beach, open since December. After more than a decade-long hiatus from opening more brewery restaurants, Karl Strauss recently opened its seventh brewery restaurant in 4S Ranch, just west of Rancho Bernardo. Karl Strauss has spent the last 10 years focusing on growing its brewing operation and expanding its beer distribution beyond San Diego, more than doubling its 20,000 barrels in 2002 to 50,000 barrels projected for 2012. The company has created 100 jobs, including hourly staff and management positions. Originally from Salt Lake City, Joshua Orr is the director of beverage, advanced sommelier at Marina Kitchen, which is located at the San Diego Marriott Marquis & Marina in downtown. Built on the idea that food is medicine, North Park's Casa de Luz, an entirely vegan, plant-based, macrobiotic communal eatery and nonprofit cooking school, is now open and aiming to keep the community healthy. In support of World Wildlife Fund's Earth Hour, L'Auberge Del Mar is turning off the lights from 8:30 p.m. to 9:30 p.m. on March 31. Hotel guests will be provided with "green" flashlights and asked to turn off guestroom lights for the hour. In the Lobby Lounge, lights will be dimmed and patrons can enjoy specially priced wines by the glass. As the chief operating officer of San Diego-style Sombrero Mexican Food, Javier Correa Jr. has been managing all aspects of his family's business since his early 20s. After growing the Sombrero brand to 19 locations throughout San Diego, Corona and Yuma, Javier and his father, Javier Sr., recently launched the company's franchise program, with the first location opening this month in O'Fallon, Mo. The Naval Base in Coronado was recently announced as the 2012 winner of the Navy Captain F. Ney Memorial Awards for outstanding food service, in the ashore category. Beginning Feb. 1, St. Germain's Bistro & Cafe in Encinitas is set to launch Lady Chef, a quarterly guest chef series featuring San Diego’s top female chefs. Gayle Covner, New York City native and Blueprint Café founder, brings a synergy of culture and cuisine to Barrio Logan. Covner also runs In Good Taste, a thriving catering business. San Diego native Kaitlin Ramos has stepped up as the new executive chef at St. Germain's Café & Bistro in Encinitas. Ramos will oversee the restaurant’s breakfast, lunch and recently launched dinner service, as well as unveiling a new menu. Danny Bannister is the chef de cuisine at the Hyatt Mission Bay's signature restaurant Red Marlin. Ruben Valenzuela is the founder and music director of Bach Collegium San Diego and director of music and the organist at St. Peter's Episcopal Church in Del Mar. Ted Gourvitz is the general manager at Fallbrook Winery. Since its inception in 1981, the winery has focused on creating wines from grapes that grow well in the local climate. Diane Powers, a recognized entrepreneur and design professional, is the creator and force behind some of San Diego's beloved retail and restaurant destinations -- The Bazaar del Mundo Shops and Casa Guadalajara restaurant in Old Town, Casa de Pico in La Mesa and Casa de Bandini in Carlsbad. As president and chief operating officer of Eddie V's Restaurant Inc., Jim VanDercook oversees all of the company’s concepts, which include Eddie V’s, Wildfish Seafood Grille and Roaring Fork. He is responsible for the development and growth of the company, with plans to aggressively grow all three brands over the next few years. Key growth markets for this initiative include San Antonio, Houston, Dallas and Southern California. Southern California native Jeff Rossman is executive chef and owner of Terra American Bistro, the East College area's first farm-to-table restaurant, focusing on sustainability and built with reclaimed materials. San Diego's only jazz station, Jazz 88.3, was named Station of the Year (large market) by Jazz Week last month. Terra American Bistro's Executive Chef Jeff Rossman's farm-to-table cookbook, "From Terra's Table: New American Food From Southern California Organic Farms," recently added a new honor to its list of accolades. The San Diego Book Awards Association recently named it the Best Cookbook 2011 in the 17th annual San Diego Book & Writing Awards. Chad White is executive chef/partner of Sea Rocket Bistro and owner of EGO Culinary Trends. The Japan Society of San Diego and Tijuana hosts the ninth annual Beer & Sake Festival on from 6 to 9 p.m., June 23, at the San Diego Marriott Del Mar, bringing together San Diego's top chefs to showcase their Japanese culinary and sake traditions for the San Diego community. The Ladeki Restaurant Group has added Mark Augarten to its executive team as vice president of operations. The 18th annual Taste of Gaslamp is slated for Father's Day Weekend -- June 18-19. The event will feature more than 25 dining venues each day. The San Diego Council on Literacy will host its second annual culinary fundraiser, "Eat. Drink. Read." May 18 at Liberty Station. The council's CEO, Jose Cruz, talks about how this event supports the organization and why fans of good books, good food and drink will want to attend. Bringing the brand and concept over from Italy, Caffe Vergnano 1882 is opening its first U.S. location in San Diego's Hillcrest neighborhood in mid-April. Gran Fondo is setting the stage for its third year in San Diego. The Italian "Big Ride" brings out more than 3,500 cyclists and thousands of spectators for the ride across the county. Hyatt Regency Mission Bay's Red Marlin restaurant is hosting its annual "Taste of Red Marlin" at 6 p.m., Feb. 8. After 13 years at its current Hillcrest location, farm-to-table themed Terra restaurant is closing its doors March 20 to move and re-open in La Mesa as Terra American Bistro. Jing Sun was born in Shenyang, China and received her degree in accounting in Dalian, China. After moving to the states in 2001, she immersed herself in American culture and received her Bachelor of Science in business administration -- finance. She soon traded her career in accounting for entrepreneurship and opened her first spa in 2009. Arterra at Marriott Del Mar has added some new additions to its executive team. Michael Wlodkowski is the new general manager who previously served as director of operations for JW Marriott, San Francisco. Following a career in real estate development and construction management, Point Loma native Abel Kaase fulfilled a lifelong dream by opening his own bar, Sessions Public, in July 2010. Dean Loring is CEO of Burger Lounge. Chris Idso is partner/chef at Pacifica Del Mar. Todd Allison, executive chef for live music venue and supper club Anthology, was born and raised in Coronado but left the area for 12 years to further his culinary education. Now he's back in San Diego and rockin' and rollin' in the kitchen. Thomas Voss is the president of the Grand Del Mar. Hamdi Gumustekin is the owner of Bernini's Bistro La Jolla. Matt Gordon is owner and executive chef of Urban Solace. Gordon, and business partner Scott Watkins, currently own and run Urban Solace restaurant in North Park, and Solace and the Moonlight Lounge, scheduled to open in Encinitas, later this year. John Small is chairman and CEO of Tapestry Resorts, based in Mission Valley. Clara Carter is the president and founder of the Multicultural Convention Services Network. Under Eric van den Haute's leadership, the Spanish tapas bar and nightclub enhanced its entertainment program, expanded its restaurant into the space next door, and opened two new locations in Riverside and Long Beach. As president and CEO of Wine Steals Inc., Ken Mills co-owns four Wine Steals locations in Hillcrest, Point Loma, Cardiff and East Village San Diego, as well as Proper Gastropub. Anchored by Mills' ingenuity and dedication to his business and customers, the Wine Steals and Proper Gastropub now employ a staff of more than 100. Tracy Borkum is the owner of San Diego's Urban Kitchen Group, which encompasses CUCINA urbana, Kensington Grill and Urban Kitchen Catering. A San Diego landmark, the Bali Hai Restaurant opened in 1955 by restaurateur Tom Ham on the then newly-constructed Shelter Island. Family-owned and operated for more than five decades, Ham's vision continues today through his daughter, Susie Baumann, and her husband, Larry, and sons, Grant and Andy. There were a lot of names thrown around for Urban Solace's new sister restaurant in Encinitas -- but the one that owners Chef Matt Gordon and General Manager Scott Watkins have decided fits the bill is Solace and the Moonlight Lounge. The San Diego Convention Center recently earned a gold certification from the International Association of Congress Centres, and is the only convention facility in the nation and just the second in North America, to achieve gold status. The Manchester Grand Hyatt is offering hefty discounts for Padres game attendees. Any Padres home game with a walkoff homer or a grand slam means everyone in the park's ticket becomes good for 50 percent off purchases up to $10,000 for rooms, restaurants, bars, the spa and more -- as long as they are redeemed anytime from the day after the game through Dec. 30. Old Town's soon-to-open historic Cosmopolitan Restaurant in Old Town has named Jeff Thurston as executive chef. In honor of its 21st anniversary, San Diego's Karl Strauss Brewing Co. is hosting a Chef Celebration Beer Dinner, featuring six local chefs preparing five different dishes paired with varying Karl Strauss beers on May 18. Trattoria Acqua on the Cove, celebrating its 16-year anniversary, recently got a renewal on its lease. The La Jolla-restaurant was nearly shut down last month when its landlord elected not to renew the lease; only after announcing closing to the public and sitting down with the staff for a final dinner, did the restaurant's landlord grant it a six-year lease extension. The family-owned landmark, Bali Hai Restaurant, is currently being revamped and will soon unveil a new look and menu. La Jolla restaurant, Trattoria Acqua on the Cove, recently announced it will be closing its doors on March 13 because the restaurant has lost its lease. Next month on March 24, Jsix restaurant and its chef, Christian Graves, play host to their annual Shuck and Swallow event featuring 10 duos -- one shucker, one swallower -- from San Diego restaurants and kitchens in a competition to see who can open and eat the most oysters in 10 minutes. The kitchens at La Costa Resort and Spa are cooking up something good -- for the plants, that is. In an effort to continue to reduce, reuse and recycle, the venue recently installed two industrial compost machines -- not to please the human palate, but instead to cater toward nature by turning kitchen scraps into a compost suitable for use on the golf course and in hotel plant and flower beds. Just two days before the Poinsettia Bowl, the Gaslamp Quarter's Fifth Avenue plays host to the Poinsettia Bowl Battle of the Bands at 6 p.m. Dec. 21. The match-up is between University of California at Berkeley and Utah State, whose bands, accompanied by their cheer squads, will line up along opposite ends of Fifth Avenue. Get ready for the second annual Blue Christmas in the Gaslamp Quarter taking place as part of Gaslamp For The Holidays from 5-10 p.m., Thursday, Dec. 10. Will you be partaking in Beaujolais Nouveau Day next Thursday, Nov. 19? For the record, Beaujolais Nouveau is a red wine made from gamay grapes produced in France's Beaujolais region. In an effort to make live classical music performance more accessible to general audiences, Music Director/Conductor John Stubbs of California Ballet, has created a multimedia performance experience where live classical music, dance and film converge for one special evening titled, Luscious Noise at Anthology in Little Italy on Sunday, Nov. 22, according to a press release. Calling all San Diegans! Jose's of La Jolla has announced it will host the first-ever sanctioned World Flauta-Eating Contest. Billed as the "Jose's World Flauta Eating Championship," this event is expected to draw the world's top competitive eaters in the final scheduled for Dec 6. The soon-to-open Italian restaurant BICE is rooted in the story of one woman: Beatrice Ruggeri, lovingly called "BICE" by her friends and family. The Gaslamp Quarter is already gearing up for Halloween. Soon the entire district will be decked out in Halloween décor, including hanging spooky banners from the Gaslamps, plus there are several fun events planned during the entire month of October. Local music has never sounded so good, thanks to a new collaboration between Anthology and KPRI (102.1). The city of Carlsbad is experiencing a restaurant boom that will bring new eateries for just about every taste, budget and dining style. More than two-dozen eateries spread throughout all corners of the city are either opening or in the works, with choices ranging from Mediterranean cuisine to nationally renowned burgers, enormous fluffy omelets and margaritas the size of a birdbath. A green partnership is under way as Greenhouse recently picked up the first load of spent yeast from Karl Strauss Brewing Co.
Little Italy's haven for music lovers, Anthology, is also equally satisfying to foodies alike, thanks to executive chef Eric Bauer, who has been at the helm of Anthology's culinary team since spring of this year -- bringing his enthusiasm and knowledge of cuisine front and center stage. Matthew "Mick" Musella, COO of the Zoological Society of San Diego, was recently appointed to serve in an ex-officio capacity on the San Diego Convention Center Corp.'s board of directors. Below the Keating Hotel sits a new champagne bar called MIX at SWAY, located inside the SWAY Lounge, which features a variety of champagnes from $4 to $85. Will Costello, headwaiter at the acclaimed Addison at the Grand Del Mar, has attained the level of advanced sommelier, a coveted certification from the American Chapter of the Court of Master Sommeliers, the premier international examining body for the wine industry. After four long years, Casa de Bandini has relocated. Scheduled to open on June 30, Bandini moves north to The Forum in Carlsbad, bringing with it the same romantic essence of Old Mexico -- reminiscent of the original location with lavish dining rooms and lush landscaping. With a plethora of pricey restaurants flanking the streets of downtown San Diego, brothers Derek and Craig Cowling knew something was missing: a chic organic burger haven for cost-conscious diners. Amy Butterfield, national sales manager for The Grand Del Mar, has earned the Convention Industry Council's Certified Meeting Professional designation. On June 7, 1999, Mexican Nouvelle restaurant Candelas opened its doors at 416 Third Avenue and began a flourishing, reciprocal relationship with its downtown neighbors. Ten years later, it is still there with many of the same staff and guests frequenting its dining room and lounge. The Japan Society of San Diego and Tijuana will host its seventh annual Beer & Sake Festival on June 25 at the San Diego Marriott Del Mar. With several decades of successful hospitality management experience, Keri Robinson has relocated to San Diego to lend her expertise to the role of area managing director for Starwood Hotels and Resorts. Barona Resort & Casino has earned the U.S. Environmental Protection Agency's Energy Star, the national symbol for superior energy efficiency and environmental protection. Commercial buildings, including hotels and resorts, that rate in the top 25 percent of facilities in the nation for energy efficiency may qualify for the Energy Star. Barona was one of only 85 hotels in the state of California to receive this recognition. For downtown La Jolla restaurant Whisknladle, the first year in business included rave reviews for its back-to-basics approach to cuisine, charming ambiance and friendly and educated services. Rounding out a successful first year, Whisknladle has also announced plans to open Prepkitchen, a take-out eatery and gourmet market, in the spring. San Diego-based catering company, Behind the Scenes (BTS), recently announced it has been selected as the caterer of choice for NBC Olympics broadcasting at the upcoming 2010 Winter Olympics in Vancouver, British Columbia. In addition, BTS also catered for the international broadcasters and corporate sponsors at the Olympics in Sydney, Australia; Salt Lake City, Utah; Athens, Greece; Torino, Italy; and Beijing. InterContinental Hotels Group announced that Hotel Indigo San Diego will open this summer in downtown's East Village. Launched in 2004, Hotel Indigo caters to guests who desire affordable luxury, personal service and an alternative to traditional hotels without sacrificing any of the business amenities they have come to expect. Karl Strauss completes expansion; celebrates 20 years in S.D. In February 1989, two college grads and a 75-year-old master brewer, who shared a passion for beer, sparked the journey of the Karl Strauss Brewing Co. -- reportedly the first craft brewery to open in San Diego since Prohibition. Chris and Matt, along with help from world-renowned master brewer Karl Strauss, realized their dream. San Diego-based and family-owned Cohn Restaurant Group recently announced the opening of 333 Pacific Steak & Seafood restaurant in Oceanside. This recent addition to the Cohn family is the group's 13th restaurant, which offers innovative cuisine, casual elegance and oceanfront dining to Oceanside. As the third largest consumer show to be held in San Diego annually, The San Diego Boat Show returns to the San Diego Convention Center and Marriott Marina Jan. 8-11, with two new features to address growing industry trends and consumer demand -- the Green Boating Zone and Affordability Pavilion. Gaslamp steakhouse Dakota Grill & Spirits recently announced the addition of Carrie Richards as the general manager, and the Cohn Restaurant Group's (CRG) newest member. Hilton Hotels Corp. announced that its newest Hilton brand property, the Hilton San Diego Bayfront, has officially opened its doors for business. Addison, the fine dining restaurant at the new Grand Del Mar, has earned one of the most coveted awards of all: a Five Diamond rating from the Automobile Association of America. Café Coyote Old Town has welcomed Mike Mitchell as its new general manager; in his position, Mitchell will oversee management, personnel and the overall operations of the restaurant. Occupying the first floor of a downtown high-rise, sits Crescent Heights Kitchen & Lounge, a California-cuisine restaurant from Executive Chef David McIntyre and his wife, Mariah. San Diego restaurant powerhouse, the Cohn Restaurant Group, has recently launched a new Web site, dinecrg.com. The site was designed with guests in mind, built from suggestions and survey feedback from e-Cuisine Club subscribers and guests. Lehn Goetz, co-owner of Old Town's Café Coyote restaurant, has been elected president of the California Restaurant Association's San Diego County Chapter (CRA). Groovy Like A Movie, a full service multi-media production company, was recently recognized by the San Diego Area Green Business Program for adopting and meeting strict environmental compliance and conservation practices. Those who relish the art of cuisine and indulging their palates are in for a treat. Next month, Old California Restaurant Row in North County celebrates nine nights of Restaurant Week, plus the ninth annual Taste of Downtown takes place. Also coming up in September, the Old Town San Diego Art Festival takes place Saturday and Sunday, Sept. 20 and 21, from 10 a.m. - 6 p.m. This free event put on by the Old Town Chamber of Commerce features over 100 contemporary artists from around the world, displaying their crafts along San Diego Avenue, plus an impressive showcase of painting, sculptures, ceramics, furniture and jewelry. Gaslamp Quarter establishment, The Oceanaire Seafood Room, was honored by Wine Spectator with the coveted "Award of Excellence," a recognition of the quality of its award-winning wine list. Since opening in 2005, Oceanaire has achieved a Wine Spectator's Award every year. Recently, The Shores Restaurant announced the hire of Lisa Redwine as restaurant manager. Redwine's experience in the food and beverage industry encompasses over 10 years in a managerial capacity, most recently at Molly's Restaurant & Bar at the Marriott Hotel, San Diego, where she served as general manager and wine director. If ever there was a company to get your motor running, your heart beating and your ego soaring, it's Arrive Like Royalty, a new boutique luxury transportation service just launched in San Diego. 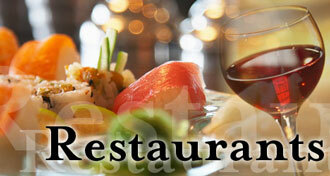 RA Sushi Bar Restaurant has announced the promotion of Joao Mezashi to head sushi chef. On July 18, at the Ivy Hotel, My Fight With Fat will host a celebrity mixer where attendees will be privy to see, smell and taste firsthand as celebrity Chef Scotty of Chile Co. cooks up a nutritious three course meal and teaches twelve culinary secrets to eating healthier and making better food choices. The event will also feature many celebrity guest speakers, an art walk, a live comedy show by Shereen Faltas and more. A plethora of exciting dining adventures await during the month of June. Four women educators with a passion for empowering girls to grow strong, independent and confident are counting down to July 1 -- which marks the grand opening of It's All About The Girl, a new party venue designed exclusively for girls age 4-16. RA Sushi will host its fourth annual "Nicky's Week" fundraiser in May to benefit St. Jude Children's Research Hospital. From May 25-31, the restaurant and bar will donate 100 percent of the proceeds from the sale of their signature tootsy maki, edamame, pork gyoza, FIJI Water, Red Bull and other select beverages to benefit the hospital. San Diego culinary veteran James Phillips has been appointed executive sous chef at Barona Valley Ranch Resort & Casino. In his new role, he will help to develop new menu items, oversee special events catering -- both on and off site -- and manage Barona's entire culinary operation alongside the resort's executive chef, Dean Thomas. The Little Italy Association announced its inaugural neighborhood food tasting festival, Taste of Little Italy, coming to be held from 5-9 p.m., Wednesday, May 14. Each year in April, across the country various companies participate in "Take Our Daughters and Sons to Work Day" which falls on April. This year, international law firm, Morrison & Foerster, which also has an office in San Diego will do something a bit extra for the young ones. At a time when the economy is experiencing a slump and corporations are cutting costs, Picnic People hopes to entice corporate, institutional and social clients with an economically-feasible opportunity to entertain and reward their employees. Picnic People, a San Diego corporate and special event picnic company, will host a tasting and headquarters open house for potential corporate, social and institutional party goers April 2 and 3. The Gaslamp Quarter plays host to its inaugural Artist Showcase Saturday, March 29. This free community art event will feature more than 50 of San Diego's leading artists gathering to display their talent on the streets and rooftops of the historic entertainment district.